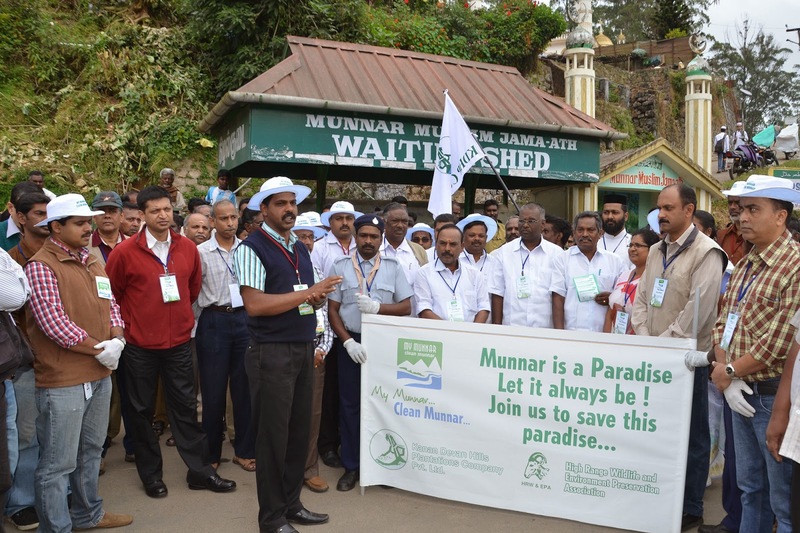 Munnar: Kannan Devan Hills Plantations Company Pvt Ltd (KDHP) took ‘My Munnar Campaign’ a step ahead by organising ‘My Munnar, Clean Munnar’ awareness rally’ jointly with High Range Wildlife & Environment Preservation Association (HRW & EPA). Chacko P Thomas, Managing Director, KDHP inaugurated the rally held at Munnar Town. People from several walks of life including politicians, local NGOs, Forest and Police Department officials, religious institutions and Merchants’ Association marched alongside KDHP employees and HRW &EPA members for two hours to show solidarity with Kannan Devan Hills Planations’ mission to promote a clean and hygienic environment in Munnar. Around 250 people turned out for the rally. The rally flagged off from Old Munnar. The participants collected litter in all their way as the rally proceeded across the town and Nullathanni Bridge and distributed pamphlets to tourists to educate them about the ‘My Munnar, Clean Munnar’ drive. B. P. Kariappa, Chairman of HRW &E PA, MLA, ex-MLA, and representatives of ‘My Munnar Campaign’ addressed the gathering. In addition to the rally, KDHP, the largest stakeholder in KDH region, also organised separate awareness rallies in all its seven estates. The campaign which specially covered major tourist spots was attended by school children and employees of all estates. Thiruvananthapuram: Chitra Ramakrishna, MD and CEO, National Stock Exchange, asked the people of Kerala to match up their financial literacy with their much-acclaimed general literacy. Chitra Ramakrishana, the first woman MD of NSE, was speaking after inaugurating the 25th anniversary celebrations of Capstocks and Securities (India), one of the leading stock broking and financial services houses in South India. “Though there have been general improvements in economic conditions, the average savings of people are still in single digit, which should be raised. It is our aspiration to help more people to partake in the prosperity that is there. One product we want an average investor to look at is exchange traded fund (ETF),” she said. In his keynote address, Sudarshan Sukhani, a prominent share market analyst and well-known TV personality, said that most of the retail investors could stick their investments to 10 or so companies among the Nifty Fifty as they were chosen through various and thorough scrutiny of experienced professionals. Sukhani said that it is enough for the ordinary investors to invest only in best quality stocks. “Do not invest in companies that are listed only in BSE. Go for the ones which are listed both in BSE and NSE. Also, do not invest in mid-cap or small-cap stocks and if at all, restrict it to a maximum of 20% of your investments in stocks. Do not trade in derivatives. Futures are only for professional investors,” he told a packed RDR Auditorium, Thiruvananthapuram. He also said we are about to see a mother of all bull markets. “In a bull market of say 15 years, there may be 10 to 15 or 20 bull-bear cycles and in a bear cycle, we should always buy. Never challenge the reason of the markets but go with its flow. Also, never base your decisions on news as most news would be late when you get it,” he said. He has also urged to increase one’s allocation of investments in shares up to 50% or more as we are entering into a bull phase. V. Rajendran, Managing Director, Capstocks, explained the logic behind his oft-quoted predication that BSE index will cross Rs.1 lakh in 2020. “Sensex EPS (combined earnings of 30 companies in the Sensex) has grown 12% to become 1340 in 2013-14 over that of the previous year. With the stable governance and new scope of economy, a 15% earnings growth in Sensex can be expected during 2014-15. Historically, Indian share markets have traded between a P/E of 13 and 28. An estimated earnings growth of 15% and the current P/E of 19 will itself take the Sensex to 30,000 by March 2015. The pace of Sensex earnings growth would accelerate further next year and an estimated 20 per cent growth for 2015-16 will take the index earnings to 1,850. This would translate to a Sensex target of around 40,000 by March 2016. If we extend Sensex earnings further with higher growth rates of 25% and a P/E of 21, the Sensex will touch 50,000 by March 2017 and 1,00,000 by March 2020,” he said. The prizes amounting to Rs.1 lakh to the winners of Young Investors Challenge, a mock investment contest organized by Capstocks for the degree and PG students in Kerala and Tamil Nadu have been handed over to Serin Cyriac, Bhavan’s Royal Institute of Management, Kochi; Dinesh A., Kongu Engineering College, Erode; Bharathan Syam, St. Albert’s College at the function. Dr. K. Ramdas, Head of Radiation Oncology Department, Regional Cancer Center, received a cheque of Rs.5 lakh on behalf of the needy patients in the center. The fund was mobilized by the management, staff, business partners and dealers of Capstocks in connection with their 25th anniversary celebrations. 26 long term investors and three franchisees of Capstocks were also honored in the event. It may be recalled that the company had given away equipment to set up smart classrooms to five needy schools across the state as part of its silver jubilee. Kochi: After completing a successful year in exporting, Grand Legend furniture, manufactured in a 60000-sq-ft modern factory set up with an investment of Rs. 25 crores at KINFRA Park, Kazhakootam, has been launched in the domestic market. Made mainly of scientifically treated, imported timber, Grand Legend offers a series of premium home and office furniture primarily targeting at the upper strata of the market. M. Parijathan, Managing Director, Mega Exports, which is the promoting company of Grand Legend, said that more than 200 people experienced in the most modern furniture manufacturing practices are working at their Kazhakkoottam factory in the three divisions including manufacturing, joinery and upholstery. The factory has a production capacity to make 20 luxury sofa sets a day. The company has launched sofas in more than 65 different finishing and styles. There are 25 varied models each in bed sets and dining tables. Parijathan said that the company’s own well-equipped R&D, joinery division and the team of designers enable it to design and manufacture furniture as per unique customer requirements and trends and suiting to the various shapes of rooms where they are placed and meant to be used. Presently, the Grand Legend products are exported to the Gulf countries and Europe. To enter the domestic market, the company has appointed 65 distributors across the state in addition to long-term exhibitions organized in major cities. In phases, the brand is planning to spread pan India. Grand Legend is a forward integration project of Mr. Parijathan, the main promoter of the Thiruvananthapuram-based Overseas Air Travels group which has been operating in the travel industry since 1981 and in timber imports and trading for the past 6 years. Teak, mahogany, mpingo and pincoda, the main types of woods used in furniture manufacturing are imported from Malaysia, Burma, Africa and Central America. Parijathan said that even though around 25% of Kerala is covered with forests, timber obtained from the Department of Forests satisfies only a quarter of the demand it has in furniture making in the state. Teak, made available through auction by the Dept. of Forests, comprises the major chunk of the domestic supply. While the domestically available teak costs around Rs.4000 per cu ft, hardwood mpingo, imported from African countries, at par with teak in quality and finishes, costs only less than Rs. 1500 per cu ft. Mpingo also lasts long for many years. In the estimated pan Indian furniture market of Rs.70,000 crores per year, Kerala is ruling the roost with its high standards of living and unique lifestyles, with an annual market size of Rs.10,000 crores. The growth of Kerala’s upper middle class has also turned out to be a fillip for the state’s furniture market which is showing a growth of 25 to 30% per annum. Considering these, Grand Legend is expecting a commendable growth in the state. Sobha Ltd. has been selected as a World Economic Forum (WEF) Global Growth Company 2014. An announcement to this effect was made on November 5, 2014 wherein World Economic Forum announced its selection of Global Growth Companies (GGCs) in South Asia, consisting of 17 of the region’s most dynamic and high-growth Indian companies. GGCs are fast-growing companies with the potential to become global economic leaders. The nominated GGCs represent a broad cross-section of industry sectors but share a track record of exceeding industry standards in growth, innovative business practices and leadership in corporate citizenship. These companies are considered trailblazers, shapers and innovators that are committed to improving the state of the world. SOBHA is the only Indian real estate company to be recognized, by the World Economic Forum and is one among only 3 listed entities out of the 17 companies that have been honoured. It is interesting to note that there is no self-nomination. Candidates are evaluated by the Forum and a selection committee composed of regional business experts. They are evaluated on the criteria of Growth, Impact, Leadership and Global Corporate Citizenship.